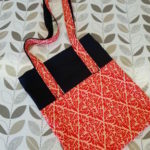 This Beginners Sewing Day is an easy introduction to sewing. It provides the starting point to learn some foundation sewing techniques whether you want to progress into dressmaking, soft furnishing or craft projects. You’ll learn how to understand sewing machines, get experience of using different stitch types, learn about stitch lengths, widths and tensions. I’ll explain what the different presser feet are for and you’ll learn how to measure and cut fabric. I’ve been sewing since I was a child and that’s a lot of years experience. During that time, I’ve made every mistake in the book. During the Beginners Sewing Day, I’ll be sharing lots of my tips. So you can benefit from my mistakes and learn to sew like a pro. I wish I’d known all this stuff when I was starting out. Utilising the skills learned in the morning to make a small project – envelope cushion or tote bag.